One reason the Northwestern Hawaiian Islands (NWHI) are so unique is that they contain some of the most isolated, pristine, and genetically pure coral reefs in the world. Kure Atoll is approximately 1,200 miles from the main Hawaiian Islands. It represents one of the last intact, predator-dominated reef ecosystems. It is a critically important habitat to a wide range of species including seabirds, sea turtles, monk seals, and sharks. The earliest creatures arrived on these islands by swimming, flying, or floating for thousands of miles and then with the passage of time, evolved into genetically different species. These species are referred to as ‘endemic’ meaning they are unique to that area. Hawai`i has a very high incidence of marine endemism due to the age of the islands (Kure Atoll is approximately 28 million years old) and the relative isolation from other coral reefs. The prevailing currents generally run from east to west; keeping larvae from other reefs from reaching Hawai`i. Also, the waters here tend to be cooler and the wave action intense, deterring foreign species from colonizing. The marine ecosystems have been far less impacted by man than the terrestrial ecosystems. Only 11 aquatic invasive marine invertebrate, fish, and algal specifies have been identified in the NWHI. The magnitude of the problem of aquatic invasive species is far greater in main Hawaiian Islands than in NWHI. Endemism and diversity in the NWHI has reportedly been higher than the main Hawaiian Islands for some corals and other reef species. However, the Northwestern Hawaiian Islands have not been free from human influence. Historically, man’s greatest impact on the ecosystems of NWHI has taken two major venues; importation of terrestrial alien or exotic species and mass slaughter or over-harvesting of existing endemic species. Understanding the past can help us protect the future of the NWHI. Early influence of man can be traced back approximately 1,000 years ago when Polynesians were the first to change the natural ecosystems of the islands. They brought to the main Hawaiian Islands animals such as boars, dogs and rats. However, the first documented evidence of mammals being introduced to the NWHI occurred in 1894 when entrepreneurs from a rabbit canning industry released rabbits that literally devoured all the vegetation on some islands; Laysan, Lisianski, and Southeast Island at Pearl and Hermes Atoll. Other alien or exotic plant and insect species (those that have been brought from other areas) drastically changed the existing ecosystems by destroying or out-competing many of the native endemic species. Until very recently the exotic Polynesian rats were major predators on Kure Atoll; eating the bird eggs and killing chicks. Today all the NWHI are completely rat free. The Verbesina encelioides that we viewed on Kure Atoll; a bright yellow flowering plant in the sunflower family, is an excellent example of an exotic, invasive plant. This weed has literally suffocated and killed native plants as well as engulfed open space used as nesting sites. Without weeding efforts by researchers, scientists and volunteers the birds would no longer have “runways” to allow the fledgings to run, take-off, and try their wings. Approximately 312 plant species have been identified on the NWHI. Thirty-seven species are indigenous, 12 endemic, the other remaining 267 are alien or exotic species. 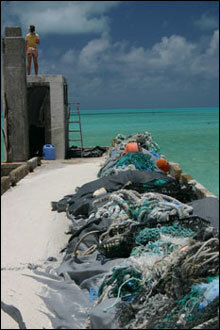 In addition to the biological invasions, man has also brought other contaminants to the Northwestern Hawaiian Islands. Even though the area is thousands of miles from human inhabitation the islands remain impacted by man’s past military occupation. Kure Atoll is still recuperating from the remains of a Coast Guard station, LORAN tower and unlined dump site on the island. Contaminants may include elevated levels of copper, nickel, lead and polychlorinated biphenyls (PCB’s). Midway contamination from military operations include; petroleum, DDT, PCB’s, and heavy metals such as cadmium, lead and mercury. Over 75 million dollars were allocated by the Department of Defense for extensive clean up efforts on Midway Atoll just prior to the Naval Air Facility’s transfer to the U.S. Fish and Wildlife Service. In the late 1800’s and early 1900’s the Northwestern Hawaiian Islands were exploited and ravished by seal hunters, whalers, feather hunters, pearl divers and guano miners. Seals, sea turtles, seabirds, sharks and whales were slaughtered en mass. In 1824 the ship Gambia may have taken as many as 1,500 seals. The ship’s log of the Ada (1882) reported taking 103 sea turtles in just three days. Japanese feather hunters slaughtered thousands of seabirds. In the period from 1904 to 1915 counts of 284,000, 64,000, 119,000 and 200,000 dead birds and literally tons of feathers, were confiscated from Japanese poachers. These numbers represent only a fraction of the slaughter; only those who were caught poaching; many hundreds of thousands of bird deaths went undocumented and undetected. During the Navy’s tenure at Midway, in an effort to protect their pilots and aircraft, they would permit the deaths of thousands of albatrosses which are large enough to cause a danger to aircraft during landing or takeoff. In the short period 1957-58, over 36,000 birds were slaughtered and unknown thousands in subsequent years in an attempt to keep a major runway clear of albatross on Sand Island. When dead albatrosses began piling up on Midway, the commanding officer ordered them dumped at sea. However, with poetic justice, the prevailing currents carried an entire barge’s contents of rotting bird carcasses back to the beach at Midway and sailors had to pick them up and bury them. The black-lipped pearl oyster (Pinctada margarifera) is one of the most obvious examples of the devastation man’s exploitation may cause. Masses of oyster beds were discovered at Pearl and Hermes in 1927. Within only three years of discovery estimates of over 200,000 oysters or 150,000 tons had been harvested and the oysters almost eliminated. An act was passed in 1929 making it illegal to take pearl oysters in Hawaiian waters. Later, in 1930, an expedition was sent to determine the extent of the damage to the oyster beds; only 480 oysters were found. By 1950 only six oysters were observed, and in 1969 only one oyster was found. More recent surveys in 1969, 1996, and 2000 found only a few oysters while a comprehensive 2003 NOAA study documented sightings of over 1,000 individual oysters. However, while the latter study suggests the oyster population may be starting to recover, almost 80 years have passed and the numbers do not begin to compare to the pre-exploitation levels. The pearl oyster clearly demonstrates the damage a coral reef can sustain from over-harvesting and the inordinate length of time it may take to recover even under full protection. Fortunately, the entire reef is partially protected from many human influences by location and strict State and Federal restrictions. Existing in such a remote location the atolls and islands do not have the typical issues of coastal pollution and eutrophication from human inhabitation, tourism, development or agriculture like the main Hawaiian Islands. For the most part, the only humans to visit this isolated wilderness are researchers and scientists and they must sign and adhere to strict government permits and quarantines. All clothing or soft goods must be frozen for 48 hours to help prevent alien insects or seeds from going ashore. All dive gear must be soaked in a bleach solution after each use. Many varieties of fresh fruits and vegetables are forbidden on the islands. However, the remoteness of the area does not protect the islands from the prevailing ocean currents and man’s trash. Currents in the North Pacific carry plastics and marine discards to the island shores. 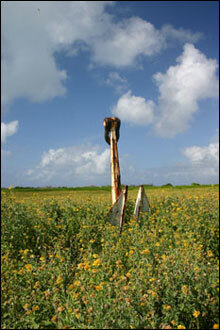 A portion of this debris may be terrestrial in origin while much of it obviously originates from fishing ships. As we walked along the shores of Kure Atoll we observed thousands of articles of domestic or household origin and items that were clearly from marine origins such as floats, nets, and other equipment connected with the industry. Based on past and current marine removal operations it is estimated that over 1,000 tons of debris has accumulated in the NWHI. Yearly accumulation rates are estimated at 40-80 tons. These amounts will continue indefinitely unless we educate and reduce the sources. Legally, acts have been passed since the early 1900’s in attempts to protect the fragile creatures of the NWHI. Earliest efforts by Teddy Roosevelt (1909) attempted to protect the seabirds from the feather hunters by establishing the Hawaiian Islands Reservation. This reservation granted protections from Nihoa to Kure Atoll (minus Midway Atoll which at the time was owned by the U.S. military). Since sea turtles travel from the NWHI to feeding grounds throughout the main Hawaiian Islands full protection did not occur until 1973 with the Endangered Species Act. Wild dolphins are protected under the Marine Mammal Protection Act, while the Hawaiian Monk Seals are protected under both the Endangered Species Act and the Marine Mammal Protection Act. The NWHI are of critical importance to monk seals and the sea turtles. The majority of the monk seals in existence live in the NWHI. Over 90% of green sea turtles depend upon the French Frigate Shores for their breeding grounds. Researchers take surveys and collect information on the life cycles of the animals in an attempt to aid recovery of the populations and ensure that any of these species will not become extinct. Data is collected on monk seals, spinner dolphins, seabirds, and turtles by researchers in the NWHI. Most recently, President Bush changed the designation of the marine area from a coral reef ecosystem reserve to include the islands as a Marine National Monument to effect more immediate change. By doing this the eight fishing permits that currently exist for the area will be phased out in five years and the entire Northwestern Hawaiian Islands will fall under more stringent long term protection. However, legislation and presidential actions will not stop the debris that is carried from thousands of miles by ocean currents and deposited on the shores of these islands or correct some of the more subtle impacts of man that remain. We need to look deeply into the past, reflect upon our trespasses, and learn from our mistakes. Only education, protection and careful scrutiny of our environment and natural resources will accomplish this and provide future protection. Prevention is a better solution than attempts to clean-up. History tells us we must be better care-takers of our fragile coral ecosystems. Liittschwager, David and Susan Middleton. 2005. Archipelago: Portraits of Life in the World’s Most Remote Island Sanctuary. National Geographic Society.